The Internet is full of ideas and suggestions, some fact and some not, on the topic of eating normally. The majority of healthy eating web sites are often of the opinion that “normal eating” is defined as being able to eat a variety of foods. Is that all there is to it? The debate is not fairly weighted with the adventurous foodies on one side and individuals trying to balance a selective diet on the other. To look at variety in the context of normal eating, it would only be fair to level the playing field. I once had a discussion with friends about which five foods (in an unlimited supply) would I want with me should I ever be marooned on a deserted island. I quickly decided on ice cream, bacon, pineapple, mashed potatoes and peanut butter sandwiches. Technically, I realize this is more than five foods, but you get the idea. Peanut butter is good, but it’s way better between two pieces of bread. A plain potato is about as boring as food gets, however, smashed and mixed with a big slab of butter and milk turns yawn into yum! Butter? Yes, I said butter. Big. Slab. Butter. Plonk! These are the foods that are going to make my extended stay away from society and loved ones comfortably bearable. Stripped of everything but the basic essentials for survival, a limited variety of food is one of the only creature comforts I have left. Under these circumstances with these dietary choices, would I be eating normally? I have a selection of all my favourite foods to choose from. I can eat more when I’m really hungry and less when I’m not. I never have to worry about running out of food. I don’t have to worry about negative comments – “ice cream is fattening; bacon is high in sodium; is that all you’re going to eat; that doesn’t even look appetizing”. 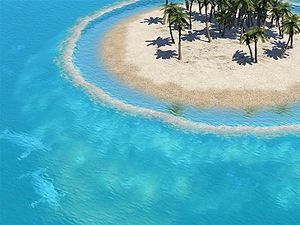 It’s just me on my secluded tropical island and all the comment free snacks I would ever wish for. Some days I might eat because I’m bored. After starting a fire to alert a passing ship on the horizon, I might fry up some bacon in excitement and anticipation of rescue. I may dig deeper into the ice cream to comfort my despair when my signal is not noticed. I might have a PB sandwich in the wee hours of the night while gazing at the stars. I may skip breakfast to enjoy the endless time I have available to sleep in late. Eating normally has absolutely nothing to do with anybody else’s definition of healthy eating. Whether your diet consists of five things or five hundred things, humans still need to eat to provide fuel for our bodies to function properly. Removed from the social aspect of eating, the gatherings, the work pot-lucks, the restaurants and the media harping on about the latest superfood, eating normally is relatively simple. I eat food I enjoy when I’m hungry and don’t when I’m not. Considering that the average human eats between 3 – 6 times a day, eating should be rewarding enough that we would want to do it over and over again. This post from Psych Central sums up normal eating and the mainstream media’s attempt to sabotage our belief of what normal and healthy eating means. So, here I am on my little island, eating normally. Does my desert island fare, however, qualify as eating healthy? 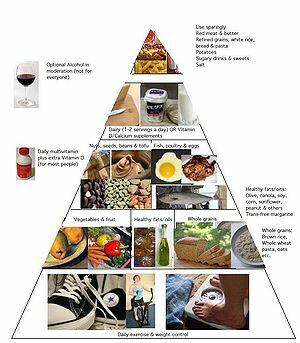 Healthy eating pyramid similar to that of the Department of Nutrition, Harvard School of Public Health. My limited selection of edibles include all four food groups, and includes carbohydrates, protein and fats. I’d say we’re good. There’s a lot of “what” in the healthy eating arguments. Dude, I’m on an island with five foods and I’m supposed to heed the advice from someone with the equivalent of a grocery store in their pantry. If you really must criticize, bring a boat and we can discuss my nutritional deficiencies over a pot of coffee on the ride back to civilization. This is what irks me most about the unwelcome criticism thrust upon selective eaters. How dare anyone should judge what someone else eats. “I never let this be a problem so I don’t have picky kids”, “it’s attention seeking behaviour”, and this from a psychologist, “selective eating adults cling to the comforts of childhood and never want to grow up.” Rarely, is there even the slightest attempt at understanding, empathy or even acknowledgement that unlike my castaway analogy, what few foods make up a selective eater’s diet is not the individual’s deliberate choice. The difference between normal eating and eating disorders is the amount of time devoted to thinking about food. Normal eating is seeing food as a response to hunger, and then going about your day. Disordered eating is characterized by an obsessive fascination with fat, sugar, vitamins, calories, etc.. to the point that it interferes with daily functioning and ultimately, the health of the individual. This is what makes selective eating such an enigma for the medical community. A severely limited diet that omits entire food groups can potentially have a profound impact on one’s health, but the eating behaviour often doesn’t have that obsessive component that is the hallmark of more well known eating disorders. I like this post from Healthy Green Kitchen and her perspective that eating healthy is a very personal choice. The author states that the way she eats causes her no concerns about her weight or her health, so why should she change anything about how or what she eats? In the adventurous foodie world, healthy eating involves dividing “good” food from the “junk” food. Within this realm is this ridiculous notion that introducing a child to junk food is what creates picky eating. It can get a bit holier-than-thou over there at times. When I talk about food in a selective eating context, there is “safe” food and “unfamiliar” food. There is no good or bad. There just isn’t enough quantity to be biased. As a parent, sure I try to provide the most nutritious options within what I have to work with, but unlike the adventurous eating world and their grocery store pantries, my son’s diet is secluded on that proverbial island. We make do with what’s available. In the throws of the mommy wars and “my kid eats more vegetables than your kid” finger pointing, I find it particularly curious that both selective and adventurous eaters, at it’s core, both have the same definition of healthy eating. It seems the majority agrees on certain comforting basics, regardless of how many foods one considers edible. It seems healthy eating has a lot more to do with how we think and feel about what we’re eating and less about the actual food. Ingesting good quality / familiar food is comforting, reassuring and just makes us feel good. The number of vegetables and the cut of meat means nothing if the food doesn’t meet our personal criteria for ‘safe to eat’. Healthy eating means trusting the food we put on our plates. Trust and eating (both normally and healthy) go hand in hand. Trust that your adult dining companion knows what he wants to eat and how he wants it prepared and presented. Trust that anyone has a good reason for removing the pickle garnish or the single floret of broccoli posing as a serving of vegetables. Trust that your child is really trying to get acquainted with unfamiliar food and knows when she has had enough to eat. Trust that commenting on the contents of a plate that isn’t your own is not only unwelcome, but also not normal nor healthy. Eating is just something human beings do. What matters most at any social gathering around food, whether it’s a special occasion or the daily meal, is the people who share it with you. Trust me when I tell you that after my hypothetical island experience, what shows up on my plate will never overshadow the welcome sounds of conversation and laughter in the presence of family and friends. I didn’t long for rescue to be reunited with food. I wanted to come home to be in the company of the people I love.